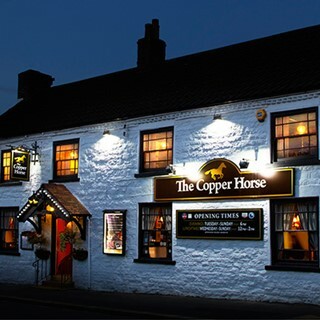 Join us for fresh and wholesome home-cooked food in the relaxed dining environment of The Copper Horse restaurant. 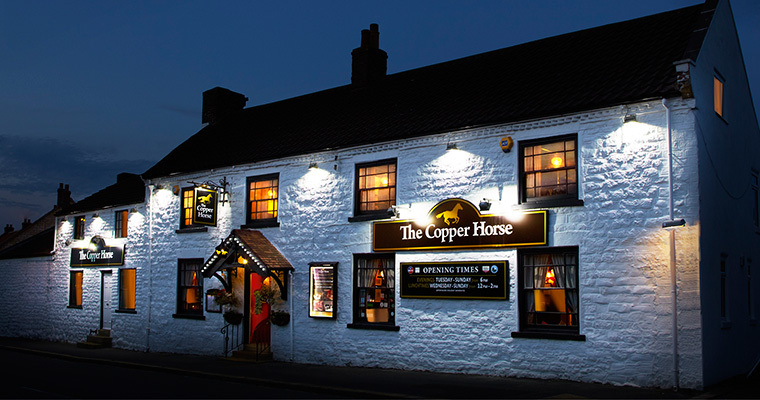 Situated in the pretty village of Seamer just outside Scarborough on the North Yorkshire coast The Copper Horse offers a truly enjoyable dining experience. Menu choices are seasonally inspired and complemented by great service from our friendly team making The Copper Horse the perfect place to meet with friends, relax and enjoy great food. We offer a delicious and varied menu, a weekly specials board plus we have a fantastic early-evening 2 and 3 course menu – making The Copper Horse the perfect location for drinks with friends, casual dinner or special occasion and lunch at the weekend. Our outside heated seating is popular all year round and well-behaved dogs are welcome in the bar. Yet again The Copper Horse has surpassed my expectations. The restaurant itself is lovely and relaxing, the staff were friendly and professional and the food was cooked to perfection! Would definitely visit again! Lovely pub for a relaxed meal. Superb gluten free menu and helpful staff. Booking system worked really well, good friendly service and nicely presented food. Not an extensive menu and could do with up flavours. Delicious food! Very good srvice, lovely atmosphere. Will definitely come back next time we visit Scarborough. I ordered the beef & ale pie, what I recevied was what looked like a frozen pie from Aldi with a shot of ale in shot glass? It tasted pretty much the same too (like a frozen pie)! Chips were raw in the middle, no veg. Rest of my party seemed to fair much better than I did, my meal was bitterly dissapointing. Also you're packed in like Sardines in a tin!, Won't be rushing back! Great dining experience...  lovely staff and service, good quality food which was nice, hot, and tasty. I thought it was a little expensive for the food we received. All in all, a good night, and we will most certainly be returning to try the menu again. perhaps the Chef will be a little more generous with the portions on our next visit. lovely table, excellent waiter. Had run out of the salad me and one of my colleagues ordered but rectified this and created me my own salad - it was excellent. Good value for money, food quite slow but worth the wait. Will be back. Three of us had lunch to celebrate a birthday. We needed vegetarian and gluten-free options, which you offered. We all enjoyed our choices immensely, and will definitely return. One minor point: the coffee was too weak. We have dined here both lunch and in the evening and it has been excellent evey time. The food and service is second to none. Thank you . We booked a table for four  - two adults and two children,Saturday night at 7 pm. We did not receive our main course until nearly 9pm. Although the food was acceptable, a 2 hour wait was not. The drinks orders were very slow also and mixed up and to top it all even though the waitress had just printed our bill and shown it to me to check, she entered a different tables amount into the card machine adding over £100 ! good job I checked. We will not be returning and will not recommend. We thoroughly enjoyed our meal on Tuesday last, as we always do. On the stength of our experience we made a reservation for April 23rd next year for a party of 10 , trust this ok. many thanks John and Marlene Alexander. I had booked for 13:30 but on arrival at 13.20 was advised that there was NO Beef left which was disappointing as I was going to have this with the roast. Had to choose an alternative dish. Wonderful venue and excellent food! Excellent for my gluten free friend. An excellent all round experience. We chose the Copper Horse because of its clear gluten-free menu and were not disappointed with both normal and gluten-free choices being of a very high standard. Waiting staff were attentive and thoughtful. The starters and sweet were very nice, one meal was reasonably good, the other (Lamb) was undercooked and served on a greasy potato rosti that was running with oil, (and no, it wasn't the normal "fat" you get with lamb, it was oil from the potato) and spoilt the dish, which wasn't cheap so should have been cooked with more care. Great food and service. good atmosphere. Will definately go back. Lovely food, the gluten free menu has lots of choice and the staff were very helpful and accommodating with our requests. Copper horse really is a fantastic dining experience. Great food in a lovely setting. We had a truly wonderful meal and would both definitely eat there again. The main qualm I had was the amount of racist posters up. I realise that the intention was to display theatrical history from the local area, but seeing "black face" everywhere during my meal was a bit upsetting. The actual food was fantastic, though. Thank you for your feedback, I am so sorry you found the décor upsetting, that is certainly not our intention, we will do our best to address this issue, however as you correctly noticed it is a history of the local acts who come to Scarborough in the 50's and is reflective of the attitude at the time. The staff on the day were very pleasant and most accommodating. However looking at the footfall they were having to deal with, we felt that at times it was difficult to get their attention. Only because they were so busy, I would guess that someone had phoned in sick. Or suggest you employ at least one other person for front of house duties, when The Copper Horse is so busy. The staff were excellent and could not have worked any harder to see that everyone's needs were being attended to. Thank you for your feedback and for being so understanding with regards to the staff, it is difficult to know how many staff to put on as our numbers fluctuate frequently and to rota effectively is a challenge and sometimes we get caught out. I am, however, pleased you found the staff on duty hard working and delivering a good service. So thrilled to have the level of choice on the gluten free menu and the food I received was excellent. My first ever outside the home crumble....yum. We will return.